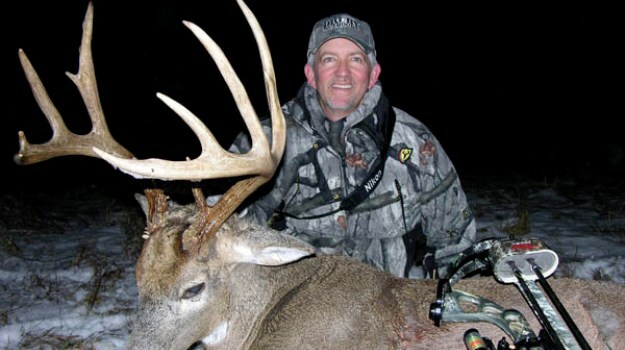 By the time you read this article, bow season in Georgia probably just will have opened. In Georgia where I hunt, we can take two bucks and 10 does each year. 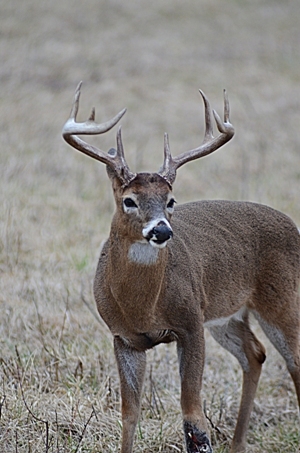 In the county I live in, there’s no antler restriction on the first buck I take, but the second buck has to have at least 4 points on one side. Because I only can harvest two bucks per season - but I can take 10 does - I take the does for meat for the freezer. Then I can wait for older-age-class bucks to hunt. From my trail-camera research, right now I know that there are four shootable bucks on the 500 acres that I hunt. There are also other people who hunt the property, and we’ve all agreed that these are the bucks we’ll try and take in 2016. But there’s another exception to the rule. Due to our 100 acres of sanctuary and the bucks harvested over the years, we realize other bucks may be on that property that are shootable that we don’t have pictures of and that we’ve never seen before. 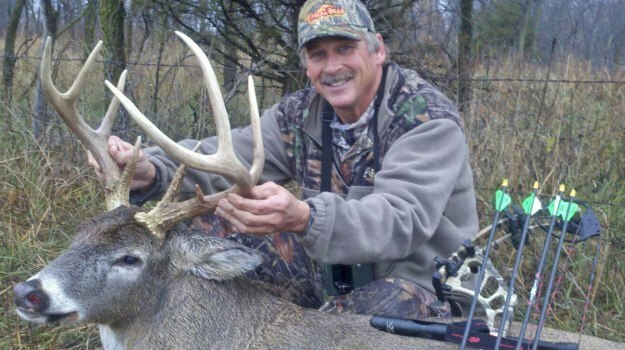 The people who hunt our 500 acres all know how we’re trying to manage our bucks, and if an older-age-class buck comes onto our land from the surrounding area, and a member wants to harvest him, common sense says we don’t need to call a meeting, and everyone agree for the person to take the buck. Now I’m all about wildlife management; but we also have to remember that deer hunting is supposed to be fun. If you have too many rules, the fun is taken out of the sport of deer hunting and people will decide if hunting’s not fun, then why do it. We also understand that every hunter, if he hunts long enough, will make a mistake. 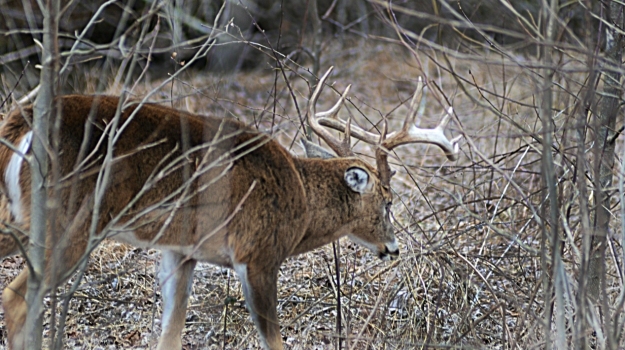 He may think a buck has plenty of points to take and is on the hit list. Then he checks the buck, and it’s not on the hit list. That’s a common mistake that can happen to anyone, and we don’t make a big deal of it. Four years ago one of my friends was hunting that 500 acres, and a buck with a drop tine showed up. No one had seen the buck before, and we didn’t have any trail-camera pictures of him. My friend shot the buck. We made pictures of the buck and showed it to a few of our neighbors. One of the neighbors said, “This buck has been on our property all year long, and we’ve got pictures of him all the way through bow season and during gun season.” But the buck was taken on our property during the rut. That mid-130-inch buck had come from about 2-miles away from our property chasing a doe, although we’d never seen him previously. To get ready for bow season, I’m also getting my muscles in shape, trying to improve my shooting skills, and checking my tree stands, cutting shooting lanes and making sure no trees have fallen across the trails I take to my tree stands. I always wear a tree stand harness before climbing up to a stand, while checking the stand and while coming down from the stand. 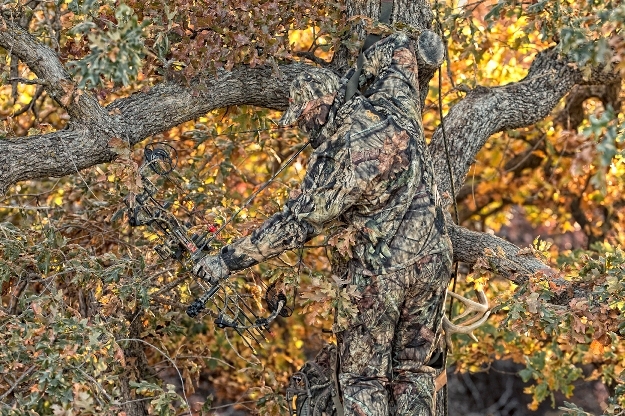 Taking a few extra minutes to use your tree-stand harness safely can save hours, months and possibly years of misery that you may have to endure if you fall while checking a tree stand or while hunting from a tree stand. Most of us buckle our seat belts when we get into our cars, so we’re as safe as possible if we’re involved in an accident. 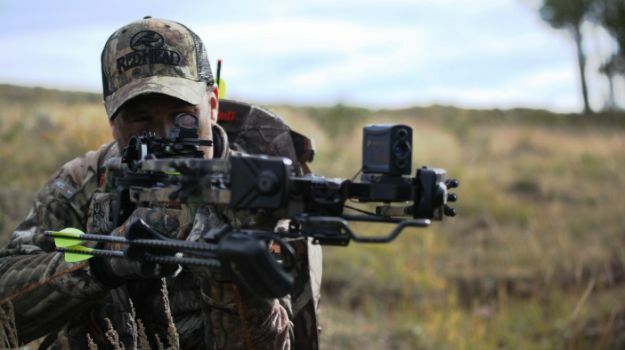 We often hunt from tree stands and staying connected to the trees from the time you leave the ground, check or get into your tree stand and return back to the ground should be as automatic as buckling up your seatbelt when you’re going to drive a car. 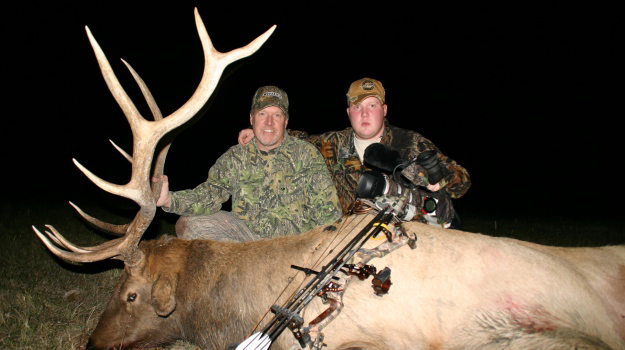 In 2008, my son, Chris, and I were elk hunting in Montana. On the morning of the fifth day of the hunt, we switched gears and began to spot-and-stalk. The afternoon found us sitting over water holes. We’d heard many bugling bulls were around the ranch we were hunting, so we followed the bugles from one bull to the next, trying to get a shot.